Ocala, FL (April 27, 2010) – Helmets are the center stage topic in equestrian safety right now, and USEF Safety Committee member Chester Weber has turned his Charles Owen helmet into a box office hit! Safety really is a movie, thanks to a camera installed on Weber’s Charles Owen helmet. When it comes to safety, Weber has always put his money where his mouth is. He and his team are long-time users of Charles Owen helmets, which provide safety and offer unparalleled comfort. “The importance of wearing helmets is in the spotlight right now, and as a driver I certainly recommend wearing helmets, especially in the marathon,” Weber said. 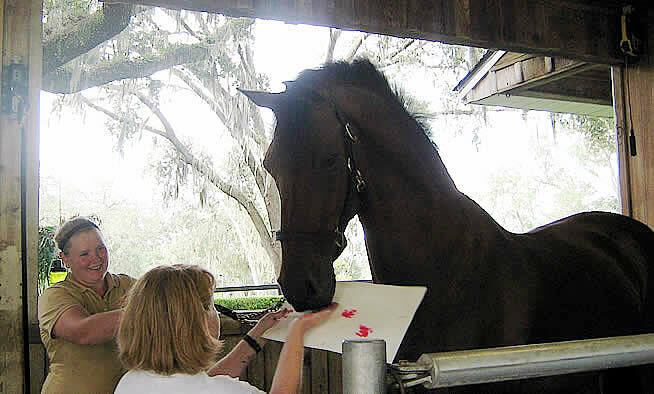 Ocala, FL (April 12, 2010) – Rolex W, one of Chester Weber’s distinguished and award-winning equine teammates, has lent his artistic horse skills to the ReRun Thoroughbred Charity Moneigh collection. Rolex not only painted a Moneigh with his nose, but due to his name and his fame, the painting will be on display in a Lexington art gallery during the Rolex Three-Day Event. Weber, the eight-time National Four-In-Hand Combined Driving Champion, lent the artistic skills of Rolex to the charity organization. 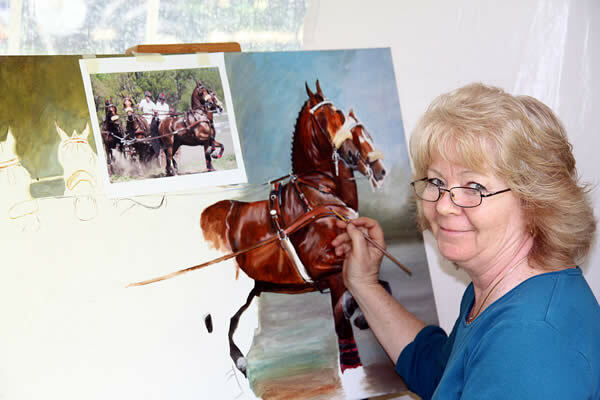 Rolex helped the ReRun Thoroughbred charity by painting masterpieces known as “Moneighs.” The name Moneigh is derived from the name of the famous artist and the sound a horse makes. 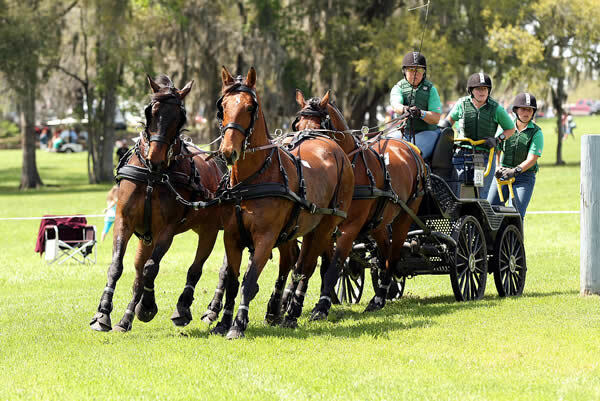 Ocala, FL (March 31, 2010) – Combined Driver Chester Weber continued his title as “record-breaking champion” during the Live Oak International competition, breaking his own record by winning the USEF National Four-In-Hand Championship for a record eight years in a row. 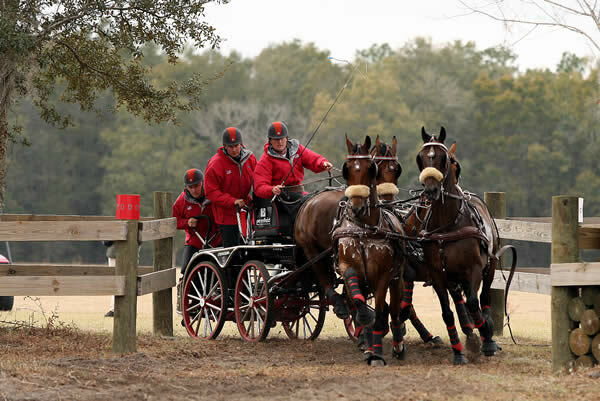 Weber’s win took place at the prestigious Live Oak event in Ocala, Florida, during a weekend filled with thousands of fans, bad weather and an incident on course that required Weber to utilize his nerves of steel and vast driving experience. Wellington, FL (March 18, 2010) – World-renowned trainer and clinician Monty Roberts is returning to West Palm Beach, Florida to host a clinic March 26th at the Jim Brandon Equestrian Center. Monty Roberts is known the “Man Who Listens to Horses,” an award-winning trainer of championship horses, best-selling author, and creator of the revolutionary equine training technique, Join-Up. Roberts has won countless awards and received worldwide press coverage. He is the author of three books on the New York Times best-seller list. He trained horses for Queen Elizabeth’s equestrian team and been awarded an honorary doctorate from the University of Zurich. Ocala, FL (January 22, 2010) – World-renowned equestrian photographer Gabriele Boiselle has captured the bond between Combined Driver Chester Weber and his animals, and the tender moment is being preserved in one of Boiselle’s 2010 calendars. The photo captures Chester Weber holding his wife’s Miniature Schnauzer, Steffi, standing with his equine partner Jamaica. 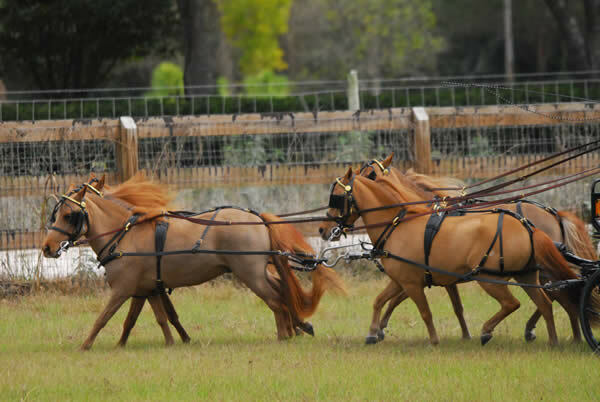 The expressive photo appears in Boiselle’s 2010 Combined Driving (or Fahren, German for ‘four-in-hand’) calendar. Boiselle has spent almost three decades traveling and photographing horses around the globe, sharing her images with her fans through calendars, books, DVDs, an online photo archive and live photoseminars. Her company, Edition Boiselle, is based in Speyer, Germany, near Frankfurt.